"With Great Power - The Stan Lee Story"
Yes, I know… no sooner do I post a 5th Anniversary Special, than do I seemingly vanish off the face of the Earth. No new posts for over a month – missing both; Halloween and Thanksgiving. But what if I tried to make up for it by presenting a blog entry that is part “ghost story” as well as a testament of my deepest thanks? – Both aspects given to me from Jack Kirby – 20 years apart. 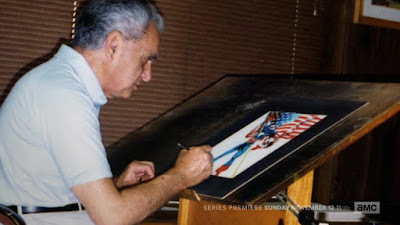 This blog entry is a true life story about how I met Jack Kirby, gave him a small gift, and how, over 20 years later, his “ghost” showed up and returned the favor. JACK “KING” KIRBY was not only one of the founders of the comic book medium, but perhaps its greatest talent as well. The worlds that burst like lightning out of his mind, the fantastic imagery that exploded like a volcano from his hand, likened him to a god; a true “CREATOR”. But this tale is not one that focuses on the myth of the man, nor on the legend that spawned such descriptors, but instead on a small personal history... and a mystery, sparked by a moment or two in time – one forever in amber within my memory – the other… captured forever on film. Take a look at the photograph atop this post, of Jack Kirby at his drawing table. Do you see the drawing of Captain America atop the King’s board? The one with which he is posed, pen in hand, as if upon which he is putting some finishing touch? Ah… I hope that got your attention. Yes. 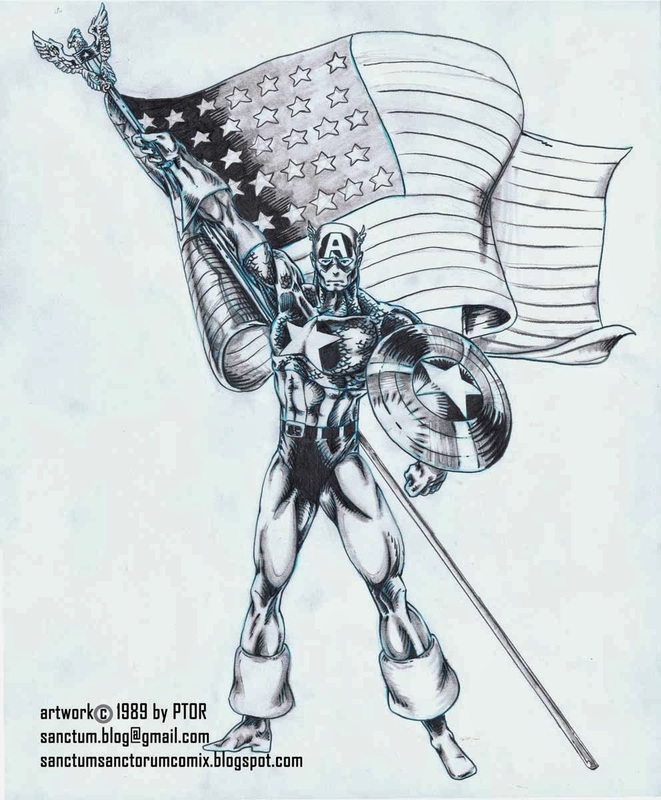 That is MY drawing of Captain America, one that I gave to the King, when I had the pleasure to meet him at a comic convention back in (late) 1990 (or early 1991). Not only that, but if you look even closer, you’ll note that the artwork is inside a black matt frame. That is because when I frequented comic-cons during the late 1980’s and early 1990’s it was as a professional artist (having had some pro work with a few indie publishers) and I would sell my work – some; original art, drawn at request, and some; hand-colored photocopies of previously drawn illustrations, framed in those mats. It was one such piece that I gave to Jack Kirby. I will provide PROOF of which here. Here is a photograph of myself, taken expressly for this post, with not only a similar, colored photocopy… not only one in the exact same type of matt… but one that was taken from my flatfile archives, where it was stored away after being colored, matted, signed & dated in 1990! In my other hand is the ORIGINAL pencil artwork, drawn in 1989 (which shows what was obscured by the mat: the Shield & Eagle atop the flagpole and the rest of Cap’s left foot, as well as the remainder of the flag). 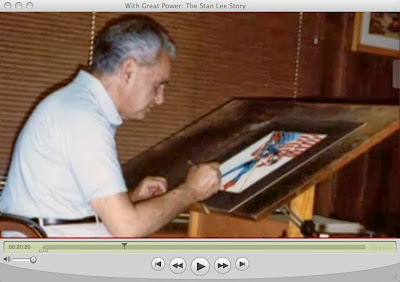 Just so you don’t think that I merely photoshopped my work into the photo (or drew it after the fact), please note that I discovered the Kirby photo while watching a documentary, on Netflix, this month: “With Great Power; The Stan Lee Story”, which was produced in 2010. Obviously, I could not have altered the image in an already-filmed documentary, which anyone can now go and verify. The Kirby photo is near the end of this clip (but around the 20 minute mark in the full video). While I have already written of my meeting with Jack Kirby, back in an old post a few years ago [HERE], I’ll recap and continue the tale now. 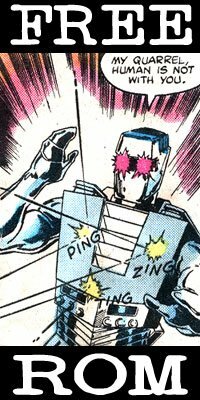 As some readers of this blog may know (as detailed in several other old posts), I was a professional writer / artist for a few independent comic companies in the late 1980’s – early 1990’s (1987 – 1991 to be exact). I had started out just as a guy with a rented table in the dealer’s room, who would either draw your custom art on the spot, or sell pre-drawn samples and even hand-colored photocopies of my work. It was in that manner that I was “discovered” by some publishers and garnered assignments for published work. With actual published credentials, I then graduated to a free table in “artist’s alley”, the professional’s room. Still, I was a young and inexperienced 20-something year-old “kid”, and every once in a while, a “real” pro artist would walk over to (or past) my table and we would get to talk about the industry. At one weekend show in New York City, I met Jack Kirby. (I also met Stan Lee at the same show, but I've already told that tale [linked to HERE]). 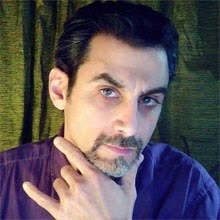 Jack was walking through the “artist’s alley” room, with his wife, Roz. I saw him, and immediately felt that I should say something… DO something… to express my gratitude for his immeasurable contribution to the field. Suddenly, I KNEW what I could do. Like the tale of the “Little Drummer Boy”, I had a gift for the King, and while it wasn’t much, it was all that I had. I quickly grabbed a hand-colored copy of a drawing of Captain America that I had done, and vaulted over my table to go and meet this iconic industry giant. I tried to gently shake his hand, but his wife, Roz said he was under strict orders by his doctor, not to do so. Understanding this, I then gave him the illustration of the comic character that HE had created - and bestowed upon the world - as a gesture of my thanks and admiration. I embarrassingly asked for an autograph, but his wife explained that the doctor's orders to rest his hands carried over to this as well, and that if I gave my name and info, he would mail one to me at a later date. While I never did receive the autograph, I took some small, humble hope that a piece of my work was in possession of the man. Although, truthfully, even that thought was fleeting, as I wondered why a giant such as he would even bother to keep such an offering. Looking at the illustration with the eyes of a more mature artist, I know that the illustration really isn’t very good. Sure, it has good qualities, but overall, it’s just not all that good. Not good enough for someone like Jack Kirby to keep it for long. I thought that maybe he’d have tossed it in the back of a closet, out of a kind sense of thankful obligation, sort of how one might keep a received birthday card in a drawer and promptly forget about it for years. Such was the fate that I imagined for my artwork; gently forgotten in the back of a closet, until it would eventually be discarded. Sadly, within 4 years of our meeting, the King was dead. I couldn’t help but wonder over the years… Did he keep it? Did he like it? Would it be thrown away with the assorted junk that accumulates on the periphery of our lives? A gift given. A memory made. And a mystery… in my mind. Now please indulge me as I flash-forward to the present and my viewing of the documentary. While flipping through the selections on Netflix, I was in the mood for some comicbook goodness, and thought a documentary would be perfect. The selection; "With Great Power - The Stan Lee Story" sounded familiar, but I knew I had never seen it. Surprising since it was released in 2010. It would be less than a half-hour before a point in my life of 20 years prior would leap into my present-day living room. When the scene in question came on screen, it felt like an electric jolt went through my body. My body went rigid, my eyes opened wide, and my mind… my mind reeled. I immediately recognized my work. But more importantly than anything, I immediately knew that Jack Kirby had kept my gift. It was as if I were seeing a long lost friend, contacting me from beyond the grave to answer a question, long thought unanswerable. To see that the great artist not only kept the piece, but had it close enough at hand for use as a prop in some photo-shoot truly brought a shock to my mind, and a sense of peace of mind as well. I can only imagine that when asked to pose for some photo opportunity (a magazine shoot perhaps), the photographer may have thought that a piece of Jack's own original black-pencil artwork might not have "popped" (which is unthinkable), or simply lacked the visual impact that a full-color illustration would instead provide. So the (ignorant) photographer just had Jack place an already-colored piece on the desk. So, looking around his studio for a suitable image, of a character that would be recognizable, not only for who it was, but that it was one of his characters, my artwork simply fit the bill. Nevermind that it wasn’t drawn by Kirby, as his hand is positioned to block the view of my signature (a ~PCK~ in a scroll with the year beneath it) which I would guess was the photographer's direction; "OK, Jack... just move your hand over a bit...there!" Authenticity may have taken a back-seat to necessity. I knew that there would only be a few people who could shine any light on these tiny mysteries (perhaps John Morrow from TwoMorrow's Press - publishers of the Jack Kirby Collector magazine, or someone from the Jack Kirby Museum project). 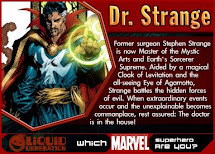 However, I also knew that there was one other man who would not only have the best chance of knowing, but who might like to discuss this story with me, and so I contacted Jack Kirby’s long-time assistant & friend, Mark Evanier (who you'll note was shown being interviewed at the start of the video clip I presented above). 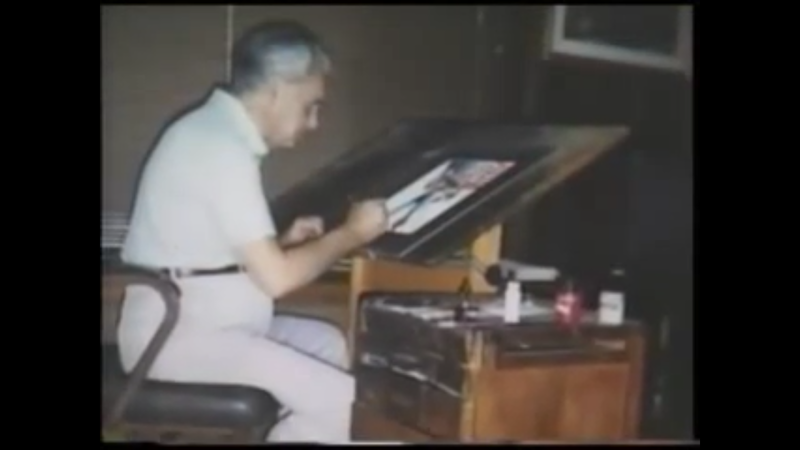 Mr. Evanier told me that Jack Kirby kept EVERY drawing that he was ever given by fans. He would keep them nearby in his studio, some hung up on the walls, some down leaning against the walls of the room, and that he would frequently interchange what was displayed on the walls and/or the floor stacks. Everyone got time to shine, and he didn’t judge the works on artistic merit more than the fact that he was thrilled that someone actually took the TIME and ENERGY to CREATE something. He was humbled, and gladdened that he was able to inspire anyone to do so, but it was the act of creation that he most admired and by which he was delighted. Most others sent him drawings OF him WITH his creations. My gift, however, was one of an impromptu nature, given on a chance meeting, and as such, was only of one of his creations. THAT, it seems is what might have been the reason that my artwork was placed upon his table for the photo. 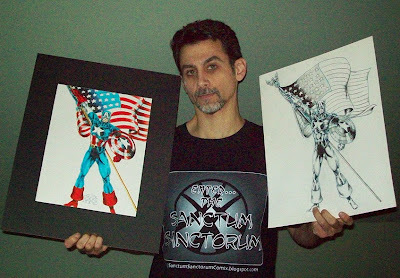 It would be unlikely for a drawing OF Jack and his characters to be drawn BY Jack, wherein my piece featuring only Captain America might have been a better fit for the photographer’s direction. That and/or the fact that without any other figures on the page, the one figure is full-sized and instantly recognizable to the viewer, if not the actual style or the fact that it wasn’t a Kirby drawing. The truth is most likely what I and Mr. Evanier both concluded; Jack was a class act and kept all things that fans gave him. His hands wouldn't allow for him to draw anything for that photo session, and maybe the color drawing just fit the bill as a prop. That I had always sort of wondered whether he kept it, whether he liked it, whether it was lost in time... all those questions were answered by one photograph, over 20 years later. For that I am grateful. For the fact that he used my drawing, my tiny gift, for the photo (even if by random chance)... I am humbly honored. And so, I just want to say once again, for all the wonders he has given the medium, all the enjoyment that he has given to me, and for the gratitude that I feel knowing that he liked and had my work near to him… THANK YOU, JACK KIRBY. It is my pleasure to state that John Morrow of the aforementioned TWOMORROWS PRESS, has expressed an interest in publishing this blog entry in one of his publications! Most likely The JACK KIRBY COLLECTOR magazine! He has asked for high quality images for reproduction of all the images seen in this post, so it should look quite nice. I'll be sure to make the official announcement when the article is published. 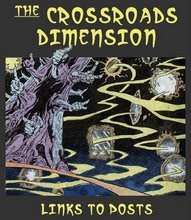 After months of trying to orchestrate an open spot in the JACK KIRBY COLLECTOR, (because, as anyone with even a smidge of publishing understanding knows, space is a premium and stories crop up and drop off constantly,) my tale was published, in a truncated form, in the letters pages of issue #64. While not the big feature story I was hoping for, it did contain most of the information from this post as well as photos seen in this post. Not too bad. While flipping around YouTube a day ago, I found ANOTHER documentary that shows the same photo of Jack Kirby with my artwork. This time, MORE of the photo is shown. The photo is at the 14:52 - 14:55.5 mark. ,at the 28 minute mark, that image was used, yet again, when speaking of the mistreatment of Jack Kirby, and how, ironically, he wasn't being acknowledged for his artwork. The episode can be watched for free on either YouTube OR the Google Play app/site. HOW many documentaries used this photo? Now, more than before I am determined to find out WHAT this photo was for and WHY Jack chose MY piece with which to pose. I may never know the answer, but I am filled with wonder.